On Nov. 15, a team at the Fermilab Accelerator Science and Technology (FAST) facility ramped up a beam of electrons to 300 million electronvolts. It was a double milestone event. 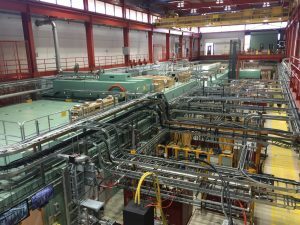 For one, the beam surpassed the threshold needed to launch a new accelerator physics program at Fermilab supported by the DOE Office of Science. The driving goal of the FAST facility is to support a new R&D accelerator that will require a minimum of 150 million electronvolts (MeV) of electron beam energy. “It’s a great achievement and an important milestone for the project and the laboratory,” said Jerry Leibfritz, project engineer for FAST. It was also a hard-earned success for the larger particle accelerator community. For the first time anywhere, the Fermilab group achieved a beam energy of 250 MeV from a single ILC-type cryomodule. For years, a worldwide R&D effort has been under way to develop cryomodules — accelerating structures — for the proposed International Linear Collider under development by a broad international collaboration for possible construction in Japan. The beam energy milestone was one of the goals of the international ILC R&D effort. The delivery of the high-energy electron beam enables the start of the accelerator research program at FAST and demonstrates that the facility is up to the job of supporting the future Integrable Optics Test Accelerator, or IOTA, scheduled to come online in mid-2018. The team behind IOTA, a 40-meter-circumference ring, is looking to break new ground in beam physics research. Once it is operable, scientists and engineers will inject beams of electrons from FAST accelerators into the ring, where they can be maintained and used to carry out R&D for new, advanced accelerator equipment and techniques. Although technology behind accelerator-based particle physics has made huge strides over recent decades, all current accelerators use magnets with linear focusing to stabilize and guide particle beams. The technique can only advance so far, however, before fundamental physics effects, which tend to destabilize beams, limit the experimental possibilities. To solve this problem, Fermilab began a research program to develop a number of novel accelerator techniques, and IOTA will be the pinnacle of this effort. Scientists from around the world will be able to use the next-generation accelerator to collaborate and test innovative ideas, finding ways around the physics constraints to reach the next level of accelerator beam power. For IOTA to carry out successful research, the FAST scientists chose a minimum threshold of energy for the injected particles. 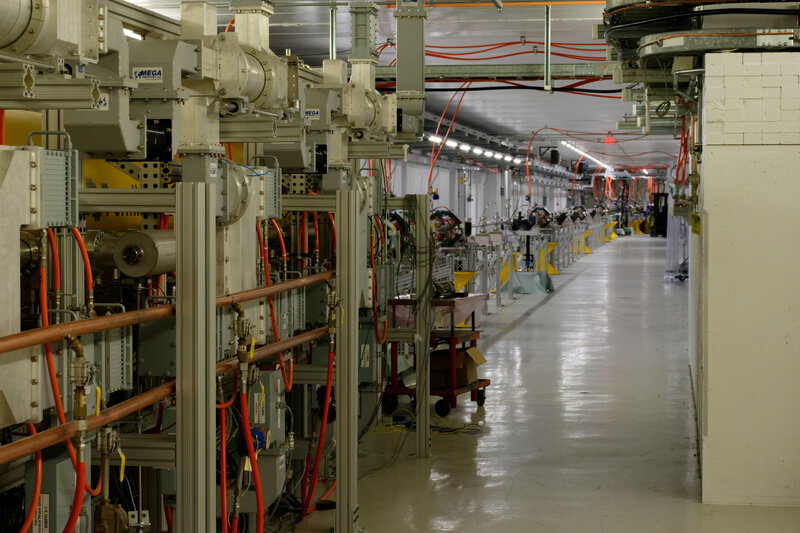 The team used a specialized beamline to produce the high-energy electron beam. “One of the biggest challenges in achieving this milestone was just getting all the complex systems and components of the accelerator to integrate and work together,” Valishev said. In one sense, it was an achievement decades in the making. 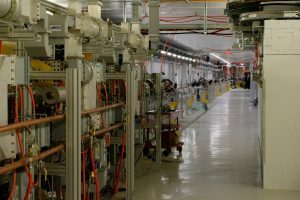 At the core of the electron-beam accelerator are superconducting elements whose development at Fermilab began in earnest in the late 1990s. That was the start of the development of SRF — superconducting radio-frequency technology — at Fermilab. SRF is the technology of choice for many current and future particle accelerators, including machines under construction now in the United States and Germany, Fermilab’s PIP-II accelerator that will provide high-intensity beams for neutrino experiments, and the proposed ILC. The ILC’s technical design, completed in 2012, requires that each 12-meter-long unit of the accelerator, called a cryomodule, deliver an electron beam energy gain of 250 MeV at a particular maxiumum gradient, which is a measure of how much energy the beam gains over a given distance. It was a formidable task for SRF experts and accelerator physicists worldwide. Now the highest-energy beam ever accelerated through the ILC-type cryomodule at design specifications has been demonstrated at Fermilab. The FAST team are now engaged in joint experiments with external collaborators, such as physicists from Northern Illinois University, the University of Chicago and Los Alamos National Laboratory. The IOTA/FAST collaboration currently has 27 partners, including CERN and the University of Oxford. The team aims to finish the ring’s construction by early 2018 and to have it up and running by the summer. Injections of protons into the IOTA ring is expected a year later.